The Amazon Fire TV is in a rather odd spot. It’s part videogame console and part set-top box, but Amazon is content to act like it’s somewhere in the middle. After trying it out for an extended period of time with both media and gaming options, I’m inclined to agree with the middling nature of the box, but it definitely has potential and covers all of the major bases to keep nearly every user happy. First things first, the Amazon Fire TV unit comes complete with a remote, power cable, and a box—the $40 controller is sold separately (more on that later). The box is longer and wider than a typical set-top box, but it’s significantly smaller in terms of height (it’s only 0.7 inches tall), which ultimately makes it rather form factor and less visible. It’s also very minimal design wise, as the only major indicator on it is a sole white LED that lets you know it’s on—that’s about it. On the back there’s an Ethernet jack, an optical audio slot, a USB socket, and an HDMI port. All in all, I even forget it was there a few times because of how tiny it is, which is a good thing. 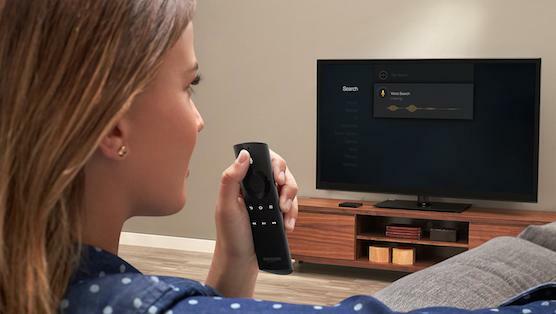 The remote is very slick, showing off a wheel-like design with buttons for all the cardinal directions, as well as a back button, home key, fast forward and rewind buttons, and a menu key. Inline with the box itself, it’s very minimal, but it gets the job done. It feels a bit slick overall to the touch which takes some getting used to, but since the remote is Bluetooth enabled and not held back by IR, you don’t need to point it directly at the box. So far so good. So what’s inside? Well you have a 1.7GHz quad-core Snapdragon processor, alongside of an Adreno 320 GPU—in other words, it leaves most boxes in the dust. It’s easy to see the power while searching on a daily basis, as results are nearly instantaneous, not to mention the fact that it remembers channels within the system memory and exactly where you left off. It’s all extremely convenient, especially when it comes to gaming. In terms of storage capacity it has 8GB, which is a modest amount if you’re not going to be playing a lot of games (many of the bigger titles are roughly 1GB each). Speaking of games, the Amazon gamepad is sadly sold separately for $40—but considering that it’s inline with other console competitors and that the product is actually well made, I’m not too angry. It feels and looks a lot like the Wii U’s updated Pro Controller, which in turns looks a lot like the Xbox 360 remote. Looks aside, it feels surprisingly comfortable to the analog sticks and D-pad are perfectly placed, and in addition to shoulder and face buttons for gaming use, it also has the full service remote buttons in tow for regular browsing. It’s not quite up to par with its console brothers’ offerings, but it gets the job done and then—in other words, it’s a valiant and viable first effort, and I’ve only had to change the batteries out once with a week of semi-regular use. The other good news is that any capable Bluetooth gamepad will work, if you want to save $40. Netflix, Hulu, Crackle and other services are loaded just like any other unit, by way of channels—apps, essentially—while Amazon’s ecosystem stands front and center with its own custom menu options. With the exception of the glaring omission of HBO Go, the Fire TV has pretty much every major service and then some. But it doesn’t stop at video, as there are other avenues to obtain media such as Pandora and iHeartRadio. Other bits like photos are supported for viewing and screensavers (and are instantly streamed to your box if you upload them through Amazon’s Cloud Drive service), but sadly, the Cloud Player that’s used for Amazon Music isn’t supported yet. Again, the Fire TV is very much a promise product in many ways. Advanced Stream And Prediction is a neat feature embedded within the Fire TV, which basically just pre-loads videos you’re thumbing over or are interested in for instantly loading. If you have a fast internet connection though it’s pretty much a useless feature since everything buffers anyway. In all of my use with the Fire TV, I only really noticed it once. The UI itself works well enough, utilizing the carousel system from its tablet line, but it’s not the most intuitive system either. Simply put, the UI is designed to mostly operate by scrolling up and down to reach new categories (such as movies, music, gaming, and options), and left and right to actually browse said options. Outside of a dedicated channel like Netflix with its own interface, things can get kind of messy while you’re slowly digging through. I’ve seen better UIs on other devices using Amazon’s own Instant Video app. So while the Fire TV doesn’t really blow me away as a video player, I’m very hopeful in terms of gaming services. Amazon has already made big moves on the gaming front, acquiring Killer Instinct and Strider developer Double Helix. You also have the major advantage of the pre-existing Amazon curated Android marketplace, which is a major plus over competitors like the fully proprietary Roku. While it isn’t a sure thing that Amazon is going to set the gaming world on fire, it’s a safe bet that they’ll at least try for roughly one to two years—in fact, they’re already courting a number of developers and have their own first-party games in development. Their first game, Sev Zero, is a nice little shooter that works well within the confines of the hardware, and really shows off that it’s a head of the pack in terms of both visual fidelity and processing power. You also have a number of Android hits, like Minecraft: Pocket Edition, Asphalt 8, Canabalt, and Dead Trigger 2, which all work well with the included controller, and Amazon is promising roughly 1,000 games to hit the service by next month. What I noticed though is that not every game had a perfect native resolution—which is common for Android gaming boxes—and like most other “open” platforms, it’s up to the developer to provide the fixes therein. Funnily enough though despite the minor snafus, I’m already seeing an upside on the Fire TV over the Ouya in just one week of use, as the marketplace is much more intuitive and full of a wide variety of Android ports. My person favorites include Sev Zero, Rayman Fiesta Run, and Minecraft: Pocket Edition. There’s also a voice search option that I’ve had mixed results with. If the microphone can actually pick up your voice, it’s fairly accurate—but with my model I had some issues getting the mic to register at all. When it does work, it only searches for Amazon-centric content within their own ecosystem, which is a major bummer for those of you who watch videos primarily on Netflix and Hulu (although voice search is reportedly on the way for Netflix). Some “other media” options do show up, but they’re often not direct links and aren’t as accurate as Amazon’s own stable of content. This is definitely something I’d like to see improved in an upcoming firmware update. The Amazon Fire TV isn’t a must-have option over any single set-top box out right now, but anyone who is knee-deep in the Amazon ecosystem can’t go wrong with it. It has plenty of room to grow in the future both in terms of channel options and the realm of gaming, but it’s still very much a “first iteration” product in many ways. If you aren’t a gamer and don’t subscribe to Amazon’s media empire, I’d take a look at an option that you maybe do already buy into, like the Apple TV or a Google option. For everyone else who’s strictly interested in video, there’s always the reliable Roku. But who knows where Amazon will take the Fire TV next. With this much potential, the 2015 version just might be the one must-have media device to have in your living room. Until then, it’s only one of a myriad of decent options.